Considering the seeming spike in triangle UFOs in the US, what could be the cause? Is there an increase of top-secret military crafts, like the Mirror UK suggests (see photo below), or alien visitation... or both? If you've seen a triangle UFO, report your sighting. Got theories on this UFO sighting and others like it? Share them in the comments or on Facebook, Twitter, or Instagram. Might just be a reflection of my fence lights off my camera or maybe ufos know how to be elusive and blend in. Sea lions stopped making noise. 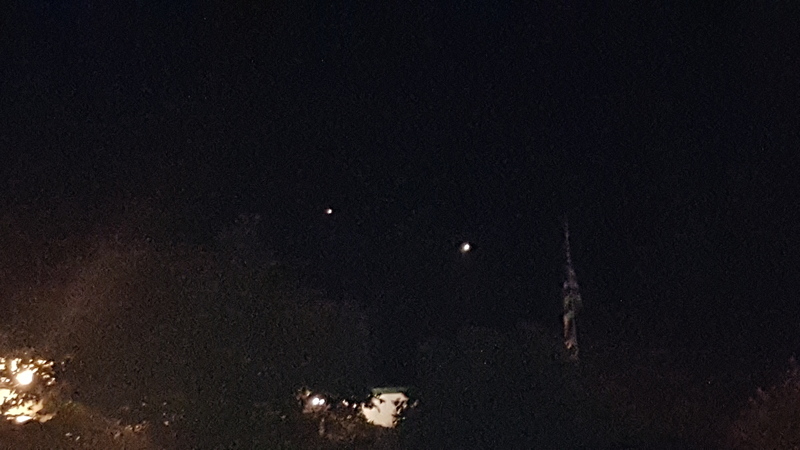 I saw an object in the sky that had 4 lights blinking in a disc shape. My fiance and I watched it move in random directions then moved behind a tree. We walked down the street to get a better view but it was gone. When we got back to the driveway we looked back to see two very large bright balls of light hovering in the sky. We watched them for several minutes then they started to drift apart then disappeared. The same day in California, a glowing orb was seen and photographed traveling up to a rainbow! Could these sightings be related? Pretty amazing photo and account! What do you think this witness saw? Could they have seen drones? Or could they be something much more mysterious than that... like aliens, or even a weird weather phenomenon? Share your theories about this UFO sighting in the comments or on Facebook, Twitter or Instagram!